story by char vandermeerIt’s hard to believe that in a city where August is punctuated by air quality alerts and the heat index routinely hits the century mark, cool salads, after taking a short hiatus in July and August, are back in rotation by September. So, smog be damned, late August is a great time to plant another round of lettuce, bitter greens and radishes. Don’t even think about planting the seeds you sowed back in March, however. This time around, splurge on heat-resistant varieties that can withstand our scorching Septembers without immediately bolting (going to seed) or turning inedibly bitter. Varieties to keep an eye out for include Red Sails, with its tasty textured leaf; the chartreuse-leafed Black-Seeded Simpson, which regenerates quickly when the outer leaves are harvested; the sweet crisp-head Rouge de Grenoblouse; and burger-ready White Boston butterhead. Plant seeds ¼-inch deep and leave at least 4 inches between plants to allow for vigorous growth. Lettuce has a shallow root system, so just about any container (like those 28-ounce tomato cans hanging out in your recycling bin) will do the trick. If the forecast calls for a day of steaming misery, simply shift your lettuce pots to a well-shaded area after making sure you’ve watered them well. If you’re the type who relishes the eye-watering burn of wasabi, then you’ll enjoy the kick that mustard greens add to a ho-hum salad, not that a salad composed of freshly plucked lettuce could ever be mundane. Collards and kale likewise produce late into the growing season, but need to be cooked—they don’t have the versatility of mustard greens. Young mustard leaves are great in salads, and the more mature greens sauté or stew perfectly. These hardy plants will stay happy well into October and November. A word of caution: both mustard greens and lettuce attract aphids like car wrecks do NASCAR fans, so try to segregate greens from more vulnerable crops like cucumbers and melons. 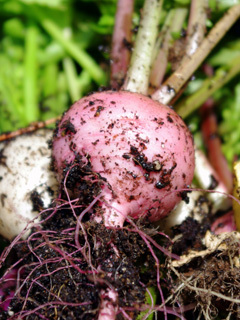 Radishes have to be one of the most rewarding crops for the container gardener to grow. Less than a month passes from seed to salad, and homegrown varieties are so much tastier than the dry, hard, bland supermarket types. Excellent options include White Icicle, French Breakfast and Long Scarlets. Not only is the seed-to-harvest time deliciously speedy, but radishes don’t mind crowded quarters. Sow seeds ¼-½ inches deep, leaving a mere 2 inches between plants. And whatever you do, don’t chuck radish tops into the compost bin: give ’em a rinse and add them to your salad, stew them with your mustard greens, or concoct a delicious Indian saag (see recipe). 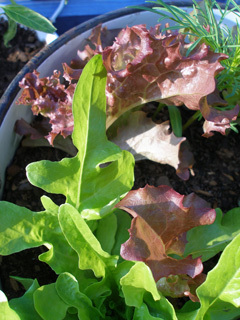 To keep the salads and saags coming in a crisp, steady stream, plant a new batch of lettuce seeds every two to three weeks, and fresh radish seeds every seven to 10 days. Consider switching to cool-weather varieties in late September or early October. In a large pot, heat the oil over medium-high heat. When the oil shimmers, add the cumin seeds and chilies. After a few seconds (the chilies will darken a shade), add the onions and garlic. Stir for 10-15 minutes or until the onions begin to turn a reddish color. Add the spinach, radish greens, turmeric and salt. Cook and stir over medium-high heat for approximately 15 minutes, or until all liquid disappears. Cover and cook on low for an additional five minutes. Remove chilies and serve with rice. Char Vandermeer tends a container garden on her South Philly roof deck; she chronicles her triumphs and travails at plantsondeck.com.